Chef Sandeep of the Infinity restaurant in the Hilton hotel in Noida-Mayur Vihar shows us the way to make their signature artichoke salad. Roast the bell peppers over open flame, peel and cut into stripes. Remove the outer leaves of the artichoke, slice and grill. Blanch the cherry tomatoes for a few seconds in boiling water and peel. 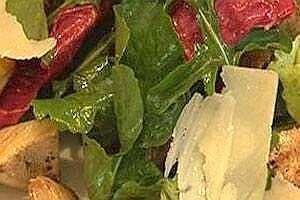 Toss the vegetables, lettuce, rucola and basil with balsamic vinegar, olive oil and season lightly with salt. Sprinkle with the shavings of aged Parmesan cheese.